Victorian emerald pearl bangle, original box by Bapst & Falize: Description by Adin Antique Jewelry. 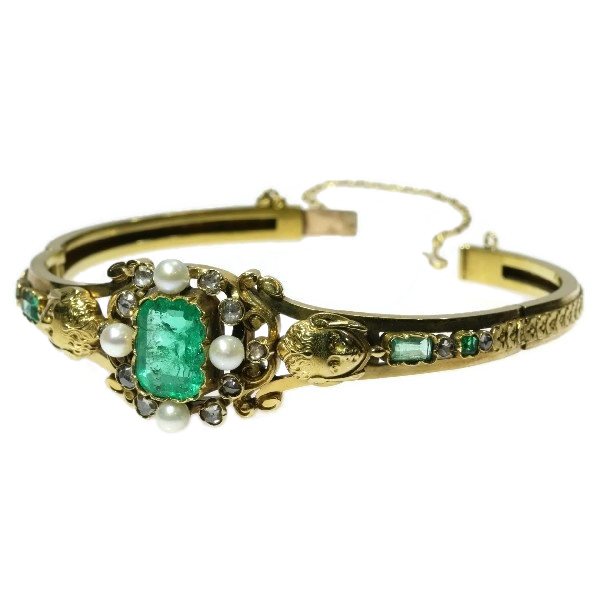 As a rustic meadow is surrounded by an orchard, so is the vast and verdant emerald of this 18K yellow gold Victorian bangle from 1870 encircled by four white pearls and ten glistening rose cut diamonds in a lobed encrustation on crown hoists from which flourishes sprout. On each edge of this forest of splendour, an engraved portrait of a nymph awaits you to chaperone you across two alternating emeralds and diamonds to reach the back of this jewel covered with a line of engraved four-leave clovers. These clovers sure bring good fortune, because this stunning piece of art comes in an original box of Bapst & Falize. Diamonds: 14 rose cut diamonds. We do not have the weight of the diamonds which is normal in our trade when it comes to rose cuts. Birthstones: Diamond is the birthstone (or month stone) for April, emerald for May and pearl for June. Brand: Although the bangle fits perfectly in the box, because of the hallmark "the owl" (see a bit further) we are not sure that the bangle also has been made by Bapst & Falize. It could have also been only sold by that company. In the exhibition organized in 1876 by the Union Centrale des Beaux-Arts appliques a l'Industrie, Lucien Falize was a jury member and official reporter on the goldsmith's work and jewelry section of the show. He and his father could therefore not be rewarded for their work, although several of their collaborators were singled out for prizes. The fact that the firm's pieces were well received probably encouraged Lucien to take part in the Amsterdam exhibition the following year. Since his father had retired after the Union Centrale show, this was the first time Lucien exhibited on his own. Lucien's long-standing desire for recognition was finally fulfilled when he participated in the 1878 Exposition Universelle in Paris. Despite the praise he had won with his father at the Union Centrale exhibitions, and on his own in Amsterdam, those smaller and more specialized platforms could not compare with the glamour and prominence of an Exposition Universelle. To be awarded one of the Grand Prix for his display, and granted the Legion d'honneur, must have seemed to Lucien the culmination of his ambitions. He described this period of professional success in a letter written to his son Andre many years later. Bapst suggested to join their firms together. On 16 June 1880, the partnership between Lucien Falize and Germain Bapst was formalized. Bapst (1853-1921), the son of a jeweler Alfred Bapst and descendant of the famous crown jewelers, could expect loyal customers and friends to follow him in this new venture. Lucien, after his recent success at the Exposition, could certainly hope to gain from the long- standing reputation of the Bapst name. Both of the new partners were widely respected for their learning and their professional skills, and must have found kindred spirits in each other. Since Lucien Falize was the official reporter on the goldsmiths' work section of the Exposition Universelle of 1889, no prizes could be awarded for the firm's splendid display. As a keen member of the Union Centrale, Lucien understood, like his father, the importance of providing proper training to those who wished to enter the trade. On 31 March 1892, the partnership between Bapst and Falize was dissolved. A new mark was registered for the firm on 21 September 1892. It was, ironically, the monogram used during the Bapst et Falize partnership, in the form of their initials separated by a diamond-set ring and a pearl, with the scrolled legend 'Adamas Margaritas' (the 'adamant' or 'unconquerable' diamond, and the pearl). Engraving: The bottom side of the bangle is nicely engraved with a line of four-leave-clovers. Hallmarks: Although it carries a typical French control mark representing an owl, we cannot be sure it is actually French as the owl was also used for items in finished condition that were brought to be examined by the French Assay office (the eagle’s head was used for items brought in unfinished).